Manufacturer of a wide range of products which include appalam making machine, papad making machine and automatic papad making machine. We are amongst the most renowned names in the industry, offering an exceptional array of Appalam Making Machine that is acclaimed for high quality and smooth operations. They are abrasion resistant in nature and require minimum maintenance. Appalam Making Machine is easy to use and is thermostatically balanced. We are counted amongst the recognized names in the industry, offering technically advanced array of Pappad Making Machine. Our entire product line is compact in designs and requires minimum maintenance. Automatic Pappad Making Machine is performance based and has high tensile strength. We are counted amongst the recognized names in the industry, offering technically advanced array of Automatic Papad Making Machine. Our entire product line is compact in designs and requires minimum maintenance. 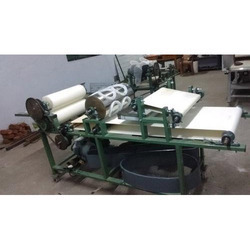 Automatic Pappad Making Machine is performance based and has high tensile strength.